Don't be put off by the rather grim Death's Head on the magazine cover; on the other hand, don't expect anything ghoulish. 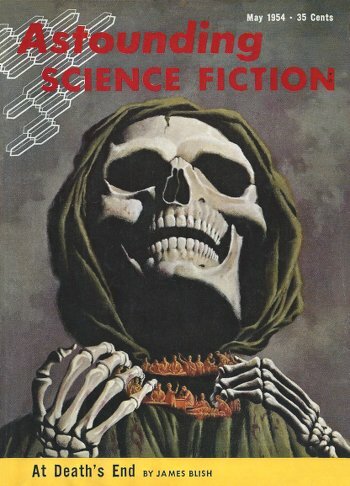 James Blish's science fiction novelet was chosen for the cover illustration for this issue by Astounding's editor John W. Campbell, and with good reason. It's a solid, thoughtful story. 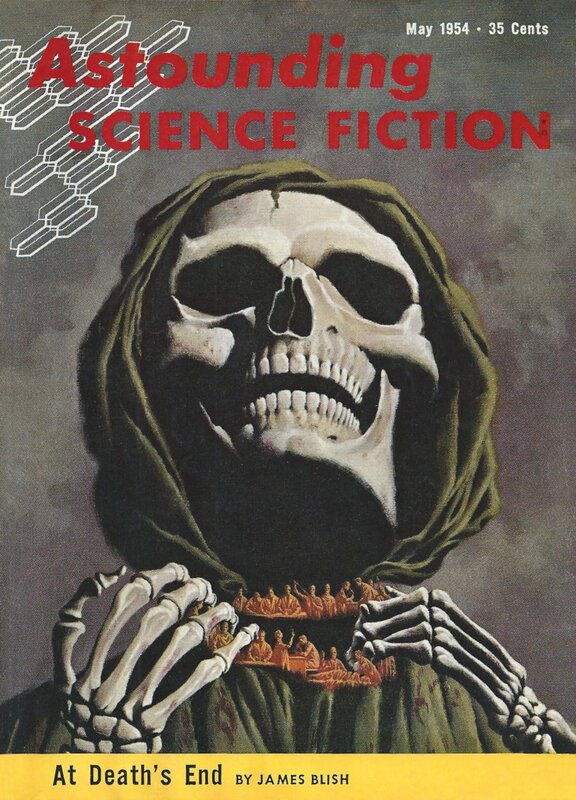 Since its title "At Death's End" and van Dongen's cover painting each specify the main point of the story, I won't worry that writing about it constitutes spoiling a surprise. Blish posits a giant pharmaceutical company, about fifty years into the future, with a major government contract to develop a general antibiotic, that is, a broad-spectrum medicine to prevent infectious diseases. In the course of their research, they realize that their next and even greater challenge is to develop a general antitoxin, that is, a broad-spectrum medicine to prevent the degenerative diseases. These latter diseases are commonly attributed to old age, although the researchers believe that is simply when most of them manifest themselves. A discovery truly transformative of the human potential and human future, if they can achieve it. Clearly Blish is taking a very long and deep perspective here. The story is near the beginning of his Cities in Flight series (although it reads well independently), in which long-life is shown as a far better solution to crossing vast interstellar gulfs than either cold-sleep or multi-generation crews. Blish's handful of characters are presented with subtlety and sympathy, saving only MacHinery, hereditary head of the FBI. The story unfolds naturally, and the thoughtful and sympathetic characters make the hypothesis, and its achievement, eminently reasonable. "At Death's End" is an enjoyable story, whether you read it independently or as merged into They Shall Have Stars, which itself is the opening novel of the omnibus volume Cities in Flight. In this story, James Blish throws down a challenge to one of our deepest presumptions about life.